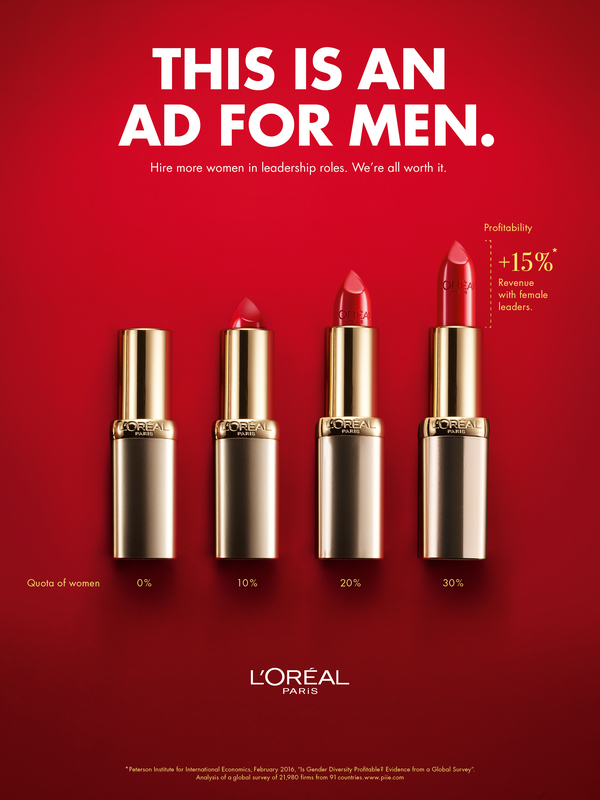 As part of L'Oreal Paris' international engagement for women program - "Women of Worth" - McCANN Dusseldorf and L'Oreal Paris celebrated International Women's Day with a special print ad dedicated to men in business leadership positions...The print campaign called “THIS AD IS FOR MEN” include 3 print ads. It’s objective is to draw attention to the fact that most German companies are dominated by men, women only making up for 8.6 percent of all stock listed German board meetings (Source: Ernst & Young 2019) and it encourages businesses to “hire more women in leadership roles”. The L’Oréal Paris Color Riche ad shows how important women are for companies - a higher number of women working in leading roles brings profit increase, based on a research of the renowned Peterson Institute for International Economics. The L’Oréal Paris Nail polish ad shows the increase in innovation (increase in patents) companies record by putting more women in leadership roles and it is based on a University of Arizona Research of Fortune 500 companies. The L’Oréal Paris Mascara ad focuses on the higher employee satisfaction score in companies with female leaders and is based on a Korn Ferry Hay Group study with Data from 55.000 professionals from 90 countries. All print ads were published in renowned business magazines and also women’s magazines (such as Vogue or Cosmopolitan).